People looking to track their diets and count their calories can choose from dozens of apps designed to help them do just that. But using the apps properly requires a lot of effort. “There’s a huge problem with self-reporting,” says Edward Sazonov, a professor of electrical and computer engineering at the University of Alabama, who has worked on a number of food tracking systems. “Imagine that you’re passing by the kitchen at work and there’s a bowl of strawberries, and you grab a couple. Are you going to pull out your smartphone and take a picture, then enter the information that you just ate three strawberries?” And if the bowl is full of candy bars instead, he adds, most app users are even less likely to record it. 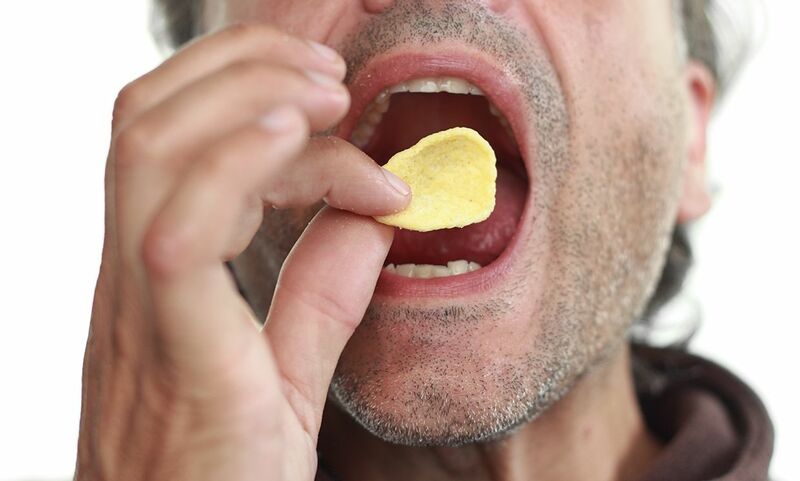 That’s why researchers are developing passive devices that monitor eating behavior. As long as people wear the device, the tech takes care of the rest. 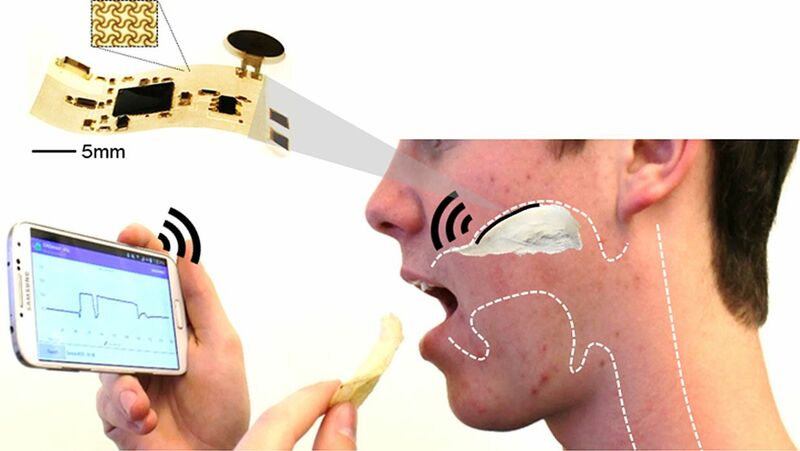 Researchers are experimenting with sensors that directly record food going into the mouth and down the gullet, and they hope to eventually turn their lab gizmos into commercial products. Sazonov’s latest invention, which he’s describing at the meeting of the IEEE Engineering in Medicine and Biology Society in July, detects the muscle motions involved in every chew. 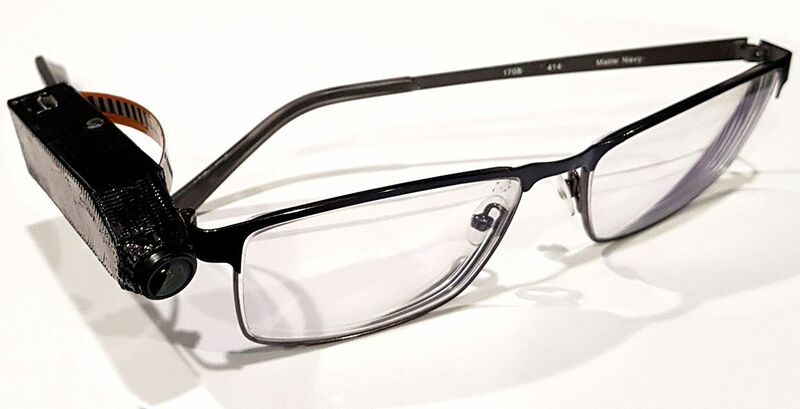 The gadget clips onto a pair of eyeglasses, and it contains two sensors: a strain sensor that presses lightly against the temple to monitor the contractions of the temporal muscle, and an accelerometer that picks up the subtle movements of the jaw. When the system detects food intake, it triggers a tiny camera (also tucked into the gadget) to take a photo every few seconds, thus creating a time-stamped visual record of the food consumed. With more than 1 billion people around the world now living with high blood pressure—a major risk factor for heart disease and strokes—doctors are keen to get people to reduce their sodium intake. But sodium, the primary component of table salt, is everywhere in our modern diets—it’s in snack foods, in restaurant meals, and in beverages. Even when people want to follow doctors’ advice, they may not realize how much sodium they’re taking in. W. Hong Yeo, an assistant professor of micro- and ­nano-engineering at Georgia Tech, is tackling the problem with a flexible electronic sodium sensor that sits in the mouth. His first prototype is battery powered and embedded in a dental retainer: “We wanted to offer easy handling and cleaning capability,” he says. But future versions could do away with the battery, instead receiving power remotely via inductive coupling, and could be small enough to stick directly to the tongue or a tooth. When users gulp down tomato juice or crunch on potato chips, the sodium sensor sends info via Bluetooth to their smartphones, giving them instant data about whether they’re busting their low-sodium diets. 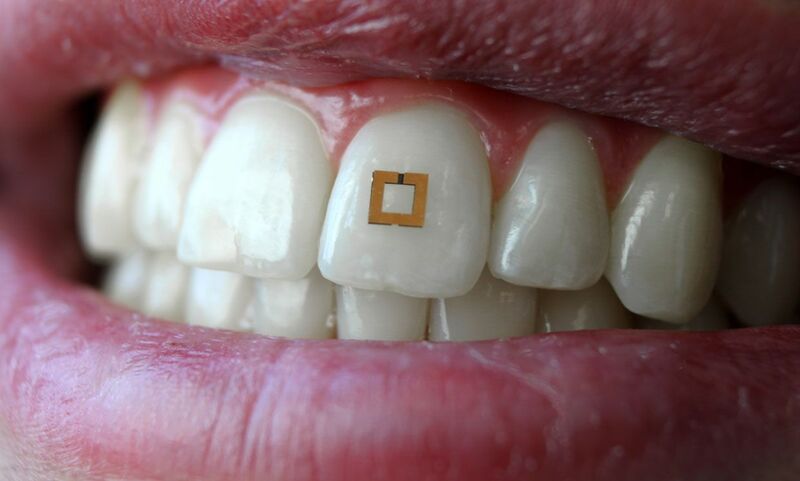 A research team from Tufts University’s department of biomedical engineering designed a tiny tooth-mounted device that can monitor people’s consumption of all sorts of toothsome things, including alcohol, salt, and sugar. Fiorenzo Omenetto led the team that developed the sensor, which is composed of an inner layer of polymer film sandwiched between two gold rings that act as antennas. When the film absorbs certain chemicals, such as ethanol, sodium, and glucose, it swells and pushes the gold rings apart. Each substance causes the film to thicken up to a different degree, so the distance between the gold rings indicates which chemical passed over the tooth. ­Omenetto’s system bounces radio waves off the tooth and records the spectrum and intensity of the wave that returns from the antenna. While alcohol, salt, and sugar are high on the list of problematic foods that consumers want to track, the sensor’s film could theoretically be tuned to detect all manner of different comestibles.